Yesterday, 10 October, two bomb blasts took the lives of 95 people and injured 246 more. 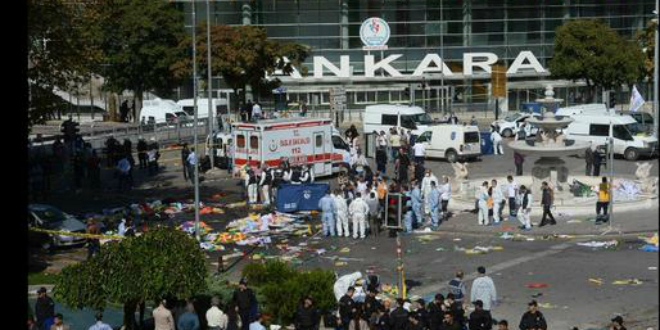 It was a shocking terrorist attack in Turkey’s capital city Ankara that has elicited expressions of sympathy and support from government leaders the world over. A number of those leaders will be participating in the G20 summit conference in the Mediterranean city of Antalya next month, so undoubtedly they will be considering possible implications of this attack. Reactions in Turkey have varied of course. The government has called for three days of mourning, and is appealing for national unity in the face of escalating violence. The opposition political parties, for their part, have blamed the government for the attack, and the leader of the extreme nationalist MHP party has refused to participate in a joint meeting to address the issues. The Kurdish separatist PKK organisation has declared a cease-fire out of respect for the victims. I am totally opposed to the use of violence to achieve political ends and in no way am I detracting from the tragedy of the event. It should, however, be pointed out that most of the victims were participating in a trade union demonstration under the banner ‘Labour, Peace and Democracy.’ Demonstrators in the ‘peace rally’ ‘included a mix of Kurdish and leftist Turkish activists’ and may well have other aims than the simple bringing of peace to a troubled world. One positive aspect of the political leanings of the victims is that the bombing cannot be blamed on Communists and left-wing groups as has often been the case here in the past. The WP article quotes Soner Çağatay, director of the Turkish research program at the Washington Institute for Near East Policy suggesting ISIS as the most likely perpetrators, saying ‘This is simply the worst terror attack in Turkish history.’ I’m not sure if that’s true, but if it is, then it falls a long way short of the nearly 3,000 death toll in the New York Twin Towers attack. I also sincerely hope that the reaction of the Turkish government will be less vengeful than that of the US Bush administration, who used the 9/11 event as justification for bloody assaults on the people of Afghanistan and Iraq in the name of ‘Enduring Freedom’. So I think yesterday’s event needs to be seen in perspective. While I am not making light of a tragic incident, there have been far worse terrorist attacks in other world cities, Madrid and London for example, without those countries descending into social chaos. I feel a little uncomfortable quoting such a source, but a senior guy in Price Waterhouse, Martin Scholich, was here the other day, expressing his optimism about Turkey and its economy. One might feel a little disquiet about support from that quarter, but the Turkish Lira has gained strength after a disturbing slide in value, so the danger of economic collapse seems at least to have been postponed. The Washington Post article, however, insists on perpetuating the doom and gloom scenario. They quote ‘pro-democracy activists’ as accusing ‘security forces of blocking ambulances arriving to treat the injured’ and saying ‘they are fed up with a state that is quick to crack down on dissenters but cannot keep its own citizens safe from terrorists’. It goes on to quote ‘media watch dog groups’ who claim that Turkey ‘has one of the world’s worst records on press freedom.’ The evidence in this case being that social media users were unable to access Twitter after the bomb blasts. Well, the pen can be mightier than the sword – and certainly we know the power of language to distort the truth and shape public opinion. Not every self-styled advocate of democracy actually believes in freedom for anyone other than him or herself. Apparently local authorities were concerned at gruesome images of dismembered bodies circulating on social media and imposed temporary restrictions. When those wishing to incite violence and social disorder hide behind the banner of ‘press freedom’ what is the appropriate response? Wikileaks was merely publicising facts about what governments were doing in so-called democratic Western states – and what was the reaction of the United States administration? Referring to police as ‘security forces’ somehow gives a more sinister aspect to officers enforcing the law of the land. I will not believe, without powerful evidence, that Turkish police wilfully prevented ambulances from accessing yesterday’s scene to help the injured. I would also note that the same people blaming the state for failure to keep its citizens safe from terrorists are probably the same ones criticising ‘security forces’ for heavy-handedness. This is a dangerous part of the world, and gentle words of warning are not always heeded. I still feel safer on the streets of Istanbul than I used to on those of Auckland or Sydney – and even students turning up to school seem to put their lives at risk in the United States. Let’s keep a little balance here, people. This entry was posted in democracy, Turkish politics and tagged bombs for freedom, democracy, Turkish politics. Bookmark the permalink. If I can trust Google’s translation software, Scholich marginalized the short term gloomy outlook. You touched on the mass-media coverage of Turkey, well done; now imagine that times ten! The mass-media hypes it so often that the impression is that the Turkish/Kurdish tensions will soon collapse the government. PWC is on my naughty list since they shut down Prometheus Ethical Investments. The latter was a great boon to the sustainability community, as it’s virtually impossible to get bank loans for organic community gardens, community solar projects and similar community sustainability projects. A decade ago, they persuaded New Plymouth to privatize Powerco, a decision that has seriously hobbled our community economically.